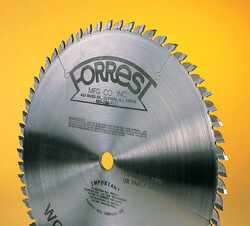 WOODWORKER I saw blades are designed for radial and table saws. 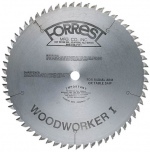 These trim and cross-cut ALL PURPOSE blades give scratch-free POLISHED cuts on wood. Crosscut up to 2" thick. Rip up to 1" thick. They have 30° alternate top bevel (ATB) with a 5° face hook on 10" diameters and small, and 20° ATB on 12" diameters and larger. The WOODWORKER I saw blade is made with double-hard and 40% stronger C-4 carbide for extended life between sharpenings and reduced yearly sharpening costs. Reduced "Jump In" for better "Pull-Control"
MOST WOODWORKER I's ARE IN STOCK FOR QUICK SHIPMENT!